I live in a suburb outside of Chicago that has experienced a lot of growth in church plants. Just take a drive down the main streets or google churches in northwest Illinois and you are sure to find a church within a mile of each other. This newfound realization led me to ask, is growing a church to fast good? When experiencing fast growth, churches tend to make decisions in a short amount of time that can have a long-lasting effect on the health and direction of the congregation. Here are a few dangers to consider when experiencing fast church growth. Church leaders are quick to react to this surge in attendance. But handling this increase must be accompanied by a lot of prayers, consideration, and planning. It is important to know your new guests. Find out what drew them to your church. Is there a population boom in your area? Are you experiencing growth while another church in the area is adapting to a decline? How can your church reach others in search of a church home? Is the community surrounding your church a growing and thriving area? These questions will help you check the longevity of your growth. An important question to ask is if your staff, facility, and congregation, can sustain each ministry. Is there a plan to accommodate a growth of 30% or 50% throughout the year? Can the plans grow with you? Do you have the available staff and resources to fulfill the needs of a growing church? Conduct an evaluation of current ministries to see if they still fulfill its original goal. Use the assessment to view which ministries will lead your congregation forward. However, it is important to remember the key mission of your church when analyzing ministries. I was part of a children’s ministry leadership team during the growth of my church. We met regularly to discuss safety concerns, facility management, and programs. Some decisions were made quickly to accommodate immediate needs without considering the long-term effect our decisions had on our ministry. As a leadership team, we had to acknowledge the mistakes we made, learn from them, and make appropriate adjustments. This took time and patience on our part as well as the families we served. Unless your elders hear the soft whispers, “if you build it they will come”, I caution you on building a new church plant or an addition. Building means money, time and planning. Before investing these resources, try modifying you r space with portable room dividers. The dividers can create classrooms, a worship center, fellowship hall, or create storage rooms. 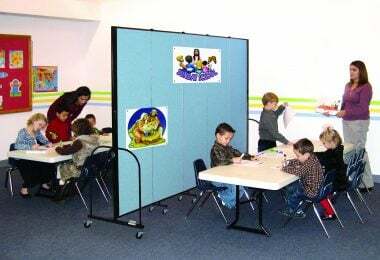 My church has Screenflex Room Dividers in every classroom. Why? To give us more usable space. Instead of 10 rooms to serve our congregation, we now had 20 classrooms. Additionally, in recent years there’s been an increase in church’s renting schools, theaters, storefronts, or vacant churches to host service. These sound absorbing portable walls can roll into any facility to allow you to use the space more efficiently and effectively. So you need more staff. Do you hire frantically from the inside or take the time to seek the best candidates from outside the congregation? This situation can lend itself to keeping or hiring the wrong person. Are the candidates you are considering experts at growing a church? Are they willing to put in extra hours and time when and wherever needed to fill the need? You may have an amazing staff, but do they have the skills and experience needed to grow the church in a positive way? Can your current staff be used in another area more effectively? Calling on your core volunteers to do more can be dangerous. I’m speaking from experience. During a season of growth, it is easy to ask volunteers to direct, teach, lead, or minister to more people without fully appreciating the volunteers. Or you may find yourself asking volunteers to serve at a new church site to help the church get started. Take time to celebrate and honor your volunteers during this season. Try to recruit more volunteers to give the “regular” volunteers some time off if needed. We have a great example of this in the Bible. Even Joseph planned for a slow season. In a season of plenty, Joseph set aside a part to feed Egypt through a famine. Be a good steward and plan for the worst while making the most during a season of growth. Have a financial plan in place to retain surplus funds in a reserve for future needs. You will be glad you did. As you seek wisdom on how to handle church growth, focus on making decisions for the long-term well-being of the church along with fulfilling the immediate needs of the church.